I picked up Natsume Yuujinchou a bit late in this season, but surely don’t regret to have finally done so. Since Mokke I found a liking in series which deal with supernatural-sensitive people who try to live a fairly normal life nonetheless. I liked Mokke a bit more because it’s spirits had a more general influence for the world in a whole while in Natsume Yuujinchou their influence is far more focused on Natsume because they want to loot his “Book of Friends”. 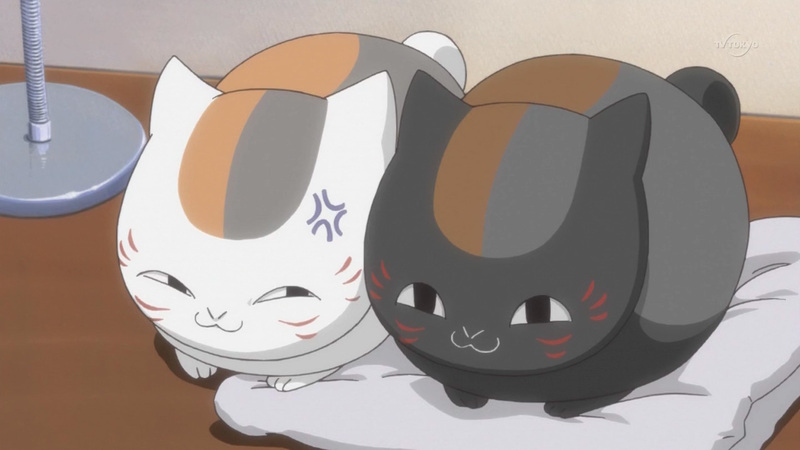 On the other hand, Natsume’s supernatural “Nyanko-sensei” (illustration not to scale) is definitely a much more likeable character than old grumpy grandpa of the Mokke girls. Bottom line is that I enjoy watching Natsume Yuujinchou and that the announcement of a second season is quite good news for me. Only problem I have at the moment is that while watching I often think that poor little Misaki is part of this anime’s cast. Guess it’s a bit understandable given the similarities of both Natsume Yuujinchou and Wagaya no Oinari-sama, namely a supernatural guardian who can form-shift (abusing this ability whenever possible), spirits aiming for the main character (splitting him into two brothers doesn’t help here) and flashbacks of the main character’s grandmother in her teens. Also with Sasada a at least possible (stalking) love interest was introduced to Natsume, but she doesn’t had enough time to leave a solid impression to far, so I guess I just fill her seat with Misaki each time. You are currently browsing the archives for the Natsume Yuujinchou category.